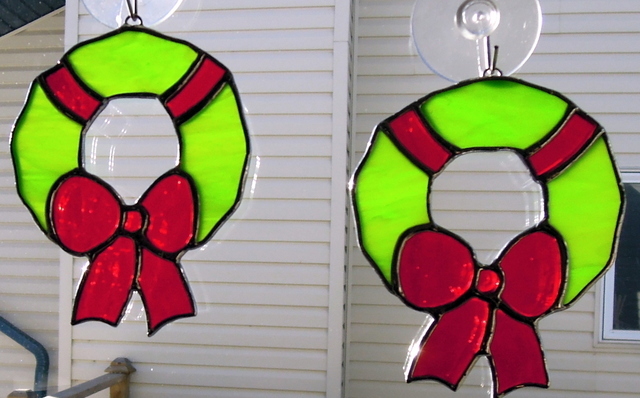 Every year we make a different Christmas Tree Ornament for our neighbours daughters and for Christmas 2018 we made these wreaths. They measured 3.5 inches wide x 4.5 inches high. 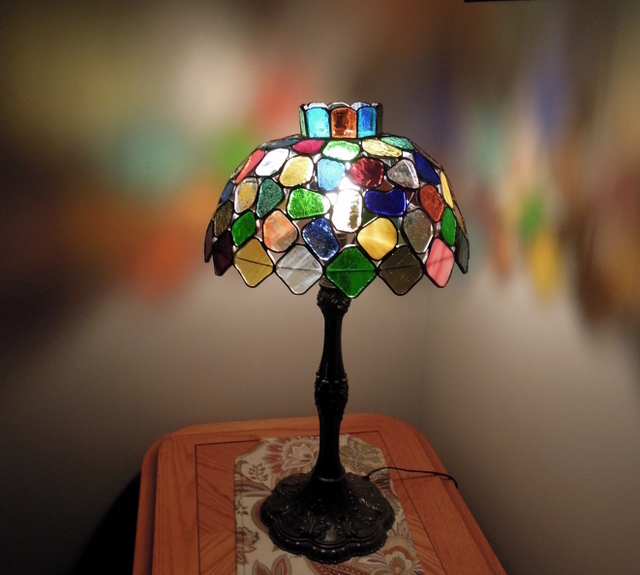 Our client’s family obtained this lamp many years ago and in our investigation we found out that it most likely was made in Mexico some 40 – 50+ years ago. The lead came that held all of the individual glass pieces together, was made by rolling flat led through a roller which gave the came it’s teeth marks on both the inside and outside of the came. For that reason we had no way of replacing the came and wanted to make sure that the lamp was as original as possible. We had to take the loose pieces of glass ( numerous ones had completely fallen out ) and after cleaning each one, we manipulated the came with small tools along with a wooden awl. 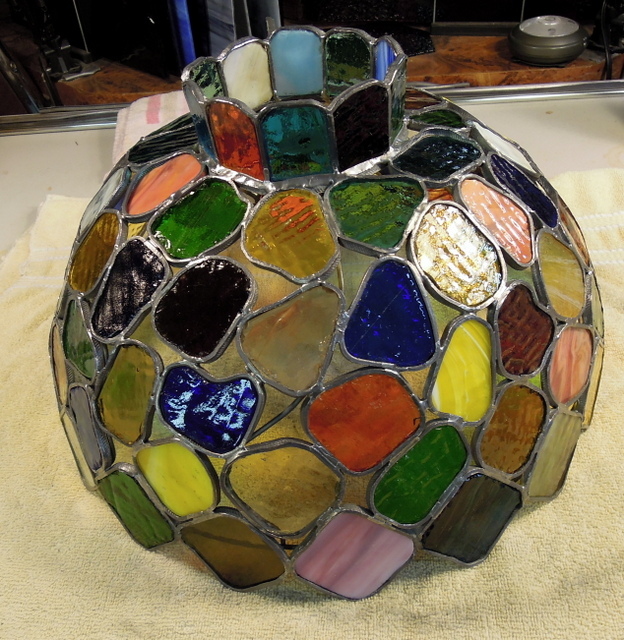 All of the glass was hand cut and grozend by hand (no grinders in those times), which left lots of chips on the pieces as can be seen in the pictures. The first photo shows the restored lamp shade. As you can see in the next photo the came was quite bent out of shape, which allowed the glass pieces to fall out, fortunately our client never lost any of those pieces. Using our hands and a wooden awl we manipulated the came where the glass pieces had fallen out. 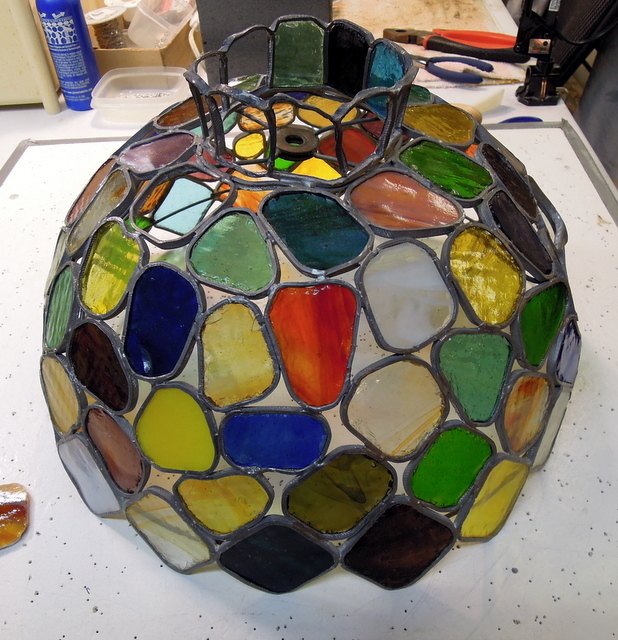 Also on the inside of the shade we re-soldered each joint to further stabilize and strengthen the shade. It was also necessary to apply some solder around the outside at the top of the shade. After cleaning with Kwik Clean to remove flux and dirt, we appling Clarity polish and after it dried we then finished off with lots of rubbing with soft cloths and tooth brushes. 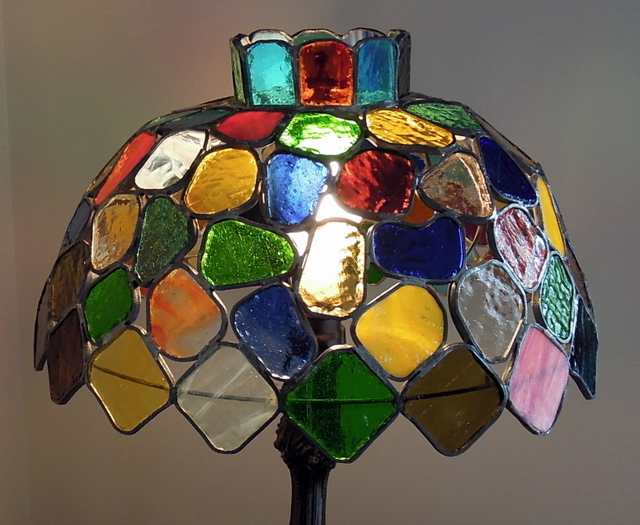 What is neat about this old lampshade with all of it’s open spaces between each piece of glass is that it gives off a colorful collage of colors on the surrounding walls when in use. 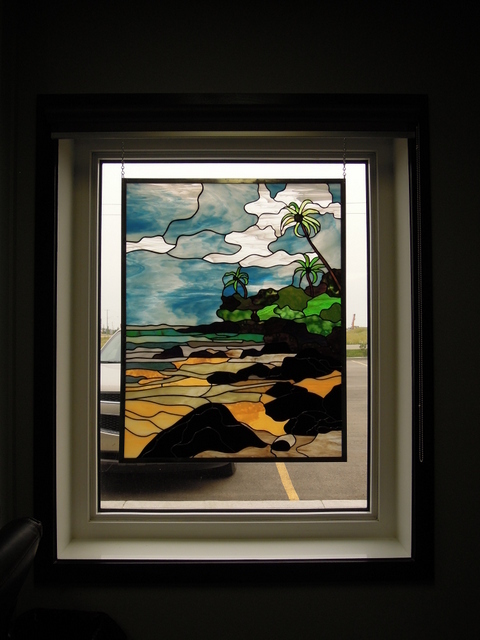 This Kee Beach panel was made in late 2011 – and has been residing in one of our son’s home in Leduc, Alberta, and this August we relocated it to his companies business office. 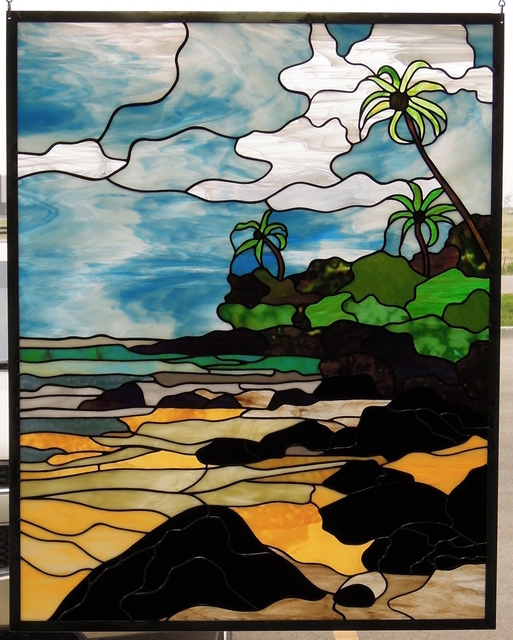 Kee Beach was originally posted on our website back in 2012, it measures 30 inches wide by 38 inches high. Kee Beach is located on the Hawaiian Island of Kauai and it was the location of the TV mini Series the Thorn Birds. The first picture shows the panel from the inside of the office and is the backside of the panel. The following photo also shows the panel from inside the office. This is how the panel looks from the business parking lot. 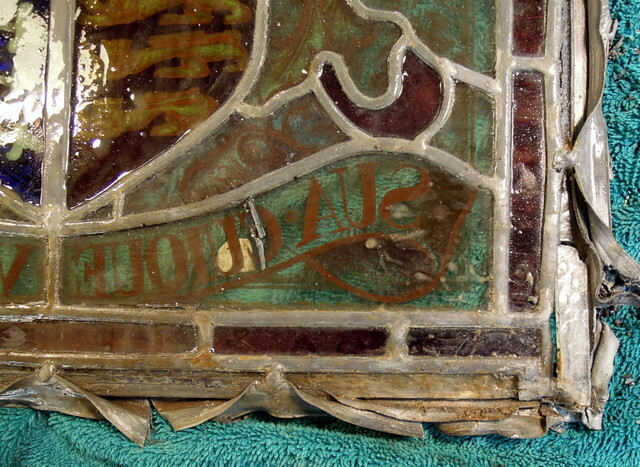 Coming soon will be the full story of this very old Family Crest Restoration. 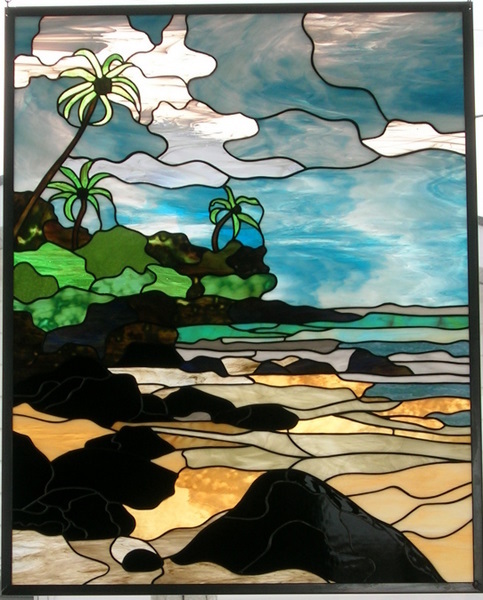 This picture is just a very small portion of this historic piece of stained glass, which had an amazing beginning, ocean travel, institution display, escaped the wrecking ball, travelled across Canada and eventually ended up in our studio to be restored. It is quite a story – stay tuned. This lighthouse measures approximately 6.5 inches high by 3.5 inches wide. We made this for the Order of Eastern Star as gift for their October 2018 meeting.